Before the film’s release, in my pre-view, I debated McQueen’s choice of the topic, saying that much has already been said about the topic of slavery, and thinking it would be hard to reach out and produce something original. And, it would have been difficult to do so, but this is Steve McQueen, a director who does not hide from the difficult, shocking or controversial, and likes to portray things as they are, without any embellishments or omissions. After the director’s underrated ‘Hunger’ (2008) and ‘Shame’, it is a relief to discover that McQueen’s talent is finally dully acknowledged by numerous nominations and awards with ‘12 Years a Slave’. Some even say that ‘12 Years a Slave’ set a new standard for realist cinematography with McQueen and Fassbender pioneering the movement, but it is often sad to point out that such cinematic brilliance has already been set in their previous films (although, maybe on a smaller scale), but, strangely, has gone almost unnoticed. ‘12 Years a Slave’ is nominated for nine Academy Awards this year, and it is a likely contender to win in the “Best Picture” Category. 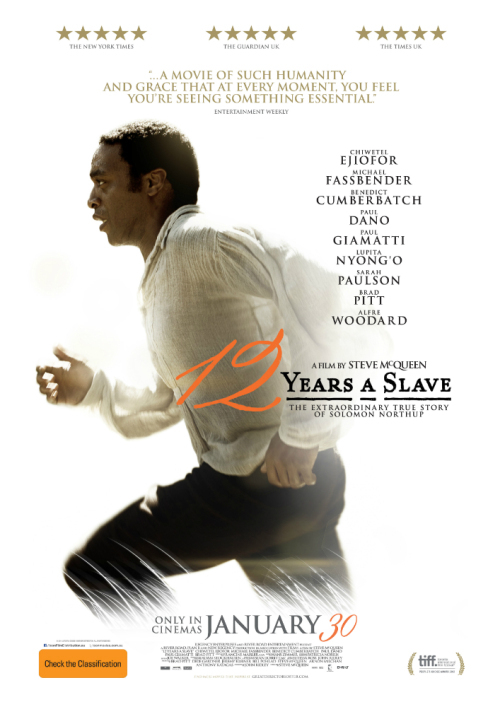 Having said that, ‘12 Years a Slave’ is probably not a film to watch after a hard day’s work to relax or unwind. Most of its time, the film is very hard to watch, and certain scenes will leave the audience rooted to the chair, if not in shock, than in sheer amazement. It is as though McQueen’s aim was to gain its audience’s full and undivided attention, and he succeeded in that. The director knows exactly how to produce the biggest impact with a controversial topic, and the audience does not even begin to imagine, before the viewing, the sheer force of the impact which ‘12 Years a Slave’ is capable of producing. The film is high on realism. ‘12 Years a Slave’ watches almost like a documentary, and, as one critic noted: the film is probably ‘the most important film ever made on the topic of slavery in the US’. After the viewing, it seems that this statement is almost an understatement, considering the sheer amount and quality of detail of a daily life of a slave which is on the display here. When I said in my previous review that Cuaron’s ‘Gravity’ (2013) is visually spectacular, but forgettable, I might not have meant it in such strong terms, but, upon viewing McQueen’s ‘12 Years a Slave’, maybe I meant just that. After all the special effects in ‘Gravity’ slowly fade away, the silently persisting and shocking themes of ‘12 Years a Slave’ virtually guarantee the iron-solid imprinting in the audience’s minds. The performances in ‘12 Years a Slave’ are nothing short of brave and powerful, and given the context in which they are played out, it is no wonder to hear of nervous breakdowns of actors on the set, e.g., as in the case of Williams and Fassbender. In fact, beatings, lynchings, family separations and other degradations all take place in ‘12 Years a Slave’, and if the actors are not completely exhausted by the end of the film, their audience certainly will be. Chiwetel Ejiofor initially refused to accept the lead role, but he gave here a truly humane and humble performance of a man who has suffered a gross injustice. Lupita Nyong’o plays a pretty slave girl who becomes the subject of constant attention of her despotic master; and, for a newcomer, Nyong’o’s performance is just brilliant. In fact, Nyong’o and Ejiofor are both this year’s nominees for the Academy Awards. The film also features Paul Giamatti, Benedict Cumberbatch and Sarah Paulson who are all good in their small roles. If there was a real revelation in the film, however, it was probably Michael Fassbender, who plays Edwynn Epps, a cruel plantation owner of Solomon. As can be seen from such films as ‘Jane Eyre’ (2011), Fassbender is capable of portraying arrogance and complete emotional detachment excellently, but his role in ‘12 Years a Slave’ is in a league of its own. Fassbender is so believable in this role of a despotic slave-owner, it is truly frightening to see him on screen: so unpredictable and terrifying his character’s behaviour is. In sum, Fassbender gives the performance of his career, deserving of his Academy Award nomination. As to any negative things about this film, there could be some noted. Depressingly realistic scenes are stylishly executed, with the lingering shots and the wonderful use of music (composed by Hans Zimmer), but they are arguably one too many. It would have been better to include in the midst of all the horror we see some bright and more light-hearted material, but the film is devised in such a way that its audience is never allowed to catch even a moment’s breath. It is also perplexing to hear so much/and see Brad Pitt’s front credits for this film, considering that he only appears in the movie for a brief period of time. Also, if one thinks that ‘12 Years a Slave’ is this inspirational film about combating slavery in the US, one will be disappointed. The trailer may give that impression, but this film is no ‘Amazing Grace’ (2006), and it is light years’ away from ‘Django Unchained’ (2012). Amen on all counts. Without question one of the best films I have ever seen, if only because it is not only unflinchingly perfect in the way it addresses slavery, but also not really about slavery, per se. It is about how corrupt systems corrupt people and make us do terrible things to each other. That very thing still happens today – see the Catholic Church protecting pedophiles, suicide bombers, African gangsters’ treatment of civilians, any ethnic cleansing campaign and so many other examples. I have never before seen Systems Theory be so well handled in a piece of fiction. Yes, interesting take, though I am not completely shocked by the film’s turn of events – black people at that time are bound to be very vulnerable, whether free or not, and given the climate, ideology and the prevalence of slavery at that time, something like that was bound to happen to some black free man someday. But if any of the white kidnappers had actually stopped to think, “By all accounts, these black people I’m apprehending appear to be people. And if they are, is what I’m doing just? Would I do this to a white person?” they would have been appalled, like we are, by their actions. But they never asked such questions, because they lived in a system that told them not to. Therein is why Cumberbatch’s character is my favorite in this movie. He really does seem like he would have been a good man in a different situation. I enjoyed Cumberbatch’s performance in the film. And what about all the rumours about the New York City commissioner’s ancestors being slaves of Cumberbatch’s family? These ‘facts’ came out after the film, like this matters? or they had to justify his involvement in the movie? Cumberbatch also played a prominent role in ‘Amazing Grace’, a good film about the fight against slavery in England. I didn’t know about those facts. Interesting. I did know Cumberbatch was in Amazing Grace. Strong review of a very strong movie. Some powerful performances throughout this moving story. I had a few issues with it that kept it from being perfect (I’m looking at you Brad Pitt), but still its a magnificent film! Thank you. I have an issue with Brad Pitt too. I am puzzled by his brief appearance. He is surely not there to boost the film’s ‘credentials’. I honestly found him and his acting more than distracting, and other lesser known actor would have done his job just as well, and maybe even better. Very nicely argued. I’m sad by the backlash this film has experienced. You can tell it’s awards season can’t you? I honestly feel this film will rise in stature over the next 10-20 years. A true masterpiece. I felt like this one was a bit overrated, but if it wins Best Picture, I’d have no problem with that whatsoever. It’s an important movie that should be seen by almost anyone and everyone who thinks that they don’t know all that there is they need to know about slavery. Good review. I’m pulling for 12 Years to win Best Picture tonight — it’s easily the best of the year. Yes, I definitely expect it to win too. I would be surprised if it didn’t. Greatly written review, and you speak nothing but the truth. Perfect score fits the bill! I understand the lack of Pitt, despite the marketing being odd, but we didn’t need for long anyways! Your points about Gravity were music to my ears. Thanks for your comment. My points about ‘Gravity’? Really? I am so glad to hear that because with all the recent fuss over ‘Gravity’ and its undeniable ‘brilliance’ I thought I was the only one thinking that. Nope, you are not alone. Yes, Gravity was brilliant in the sense of the director having a great vision, and it has terrific CGI. However, the script was lacking, and I found myself bored. What’s worse? The dialogue of Clooney. As he is falling in risk of death, “Don’t I just have the most gorgeous eyes?”. ARE YOU KIDDING ME? haha. Yes, haha, that was something, and I do agree with you about the story which is essentially lacking for such a major film; I am one of those people who prefers the quality story over special effects and I think it is very important for the audience to actually believe in what was happening on screen, that’s why what also annoyed me a bit was how they managed to make Clooney’s character this hero of all times, this funny guy who is willing to sacrifice himself for others – that’s fine, but if you look at many of his other films, especially recent ones – he just appeared there a complete and utter cynic. It is very hard to forget this image of his while watching ‘Gravity’, and it is this lack of belief in the dialogue’s genuineness and his real character in ‘Gravity’ which troubled me. That’s why I thought maybe some other actor would have done a better job. I agree 100%. I am not a big Clooney fan, and after Gravity, not sure if his name will ever sell me a movie ticket again. Even Doctor Stone was bad when you think about it. Who would let a moron like that into space? I can deal with silliness, but when the movie is blatantly throwing theme after theme, and combining it with headache inducing characters….it was just….not my favorite. Great review, such a visceral and powerful movie. Great review! I agree, wonderful performances, and a film I won’t forget anytime soon! I really like the movie, but I think it could have shortened a little. For example, there was a scene when it was just the main character’s face staring into space. Nothing was happening, and I think I got the gist of the scene, but it lasted way too long for my taste. Maybe it’s just me, but there were several scenes like that throughout the film that could have shortened, and may have improved the movie even more. A really powerful movie that deserves to be seen and praised. Steve McQueen’s made a fantastic job!